My husband and I are blessed to be able to celebrate the wedding of a dear, long-time friend of mine. She is an "older" bride who often worried why love had so often passed her by, while so many of her friends had found seemingly long-lasting love. And then she met John. One morning after we were married, my husband, in a very matter-of-fact manner, pulled me in close, sighed deeply, and said, "It's like we're living in magic." 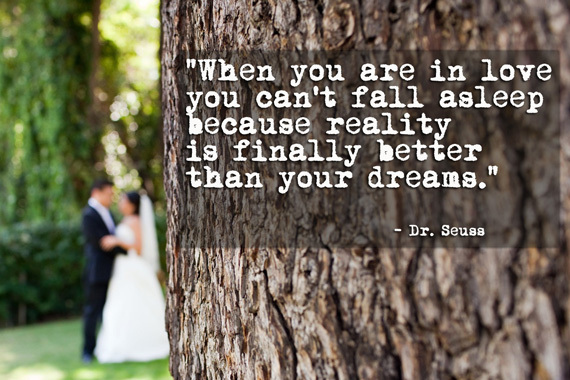 Indeed, like Dr. Seuss said, when you're in love, reality is better than your dreams. You are living in magic, as my husband so perfectly articulated. Today, on my dear friend's wedding day, I wish for her a life of magic. It's no less than I wish for us all. To spend your life with the one you love is the magic that makes life worth living. So Delicious! I love this. I was a late bride - not marrying until I was 36 years old. It seemed an eternity of waiting. 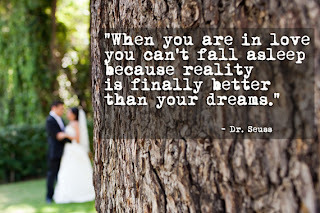 But my life since then, and we've been married nearly 10 years, has been so completely well worth waiting for. 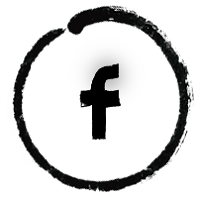 I am so happy to have stumbled onto your blog from BlogHer. Everyone deserves love and magic in their lives. Brilliant! Thank you for the feedback, ladies! I am thrilled that you're here. Liesel, I married on the older side as well, and you're both so right . . .completely worth the wait.